The Earth Sciences have a long history in Oxford, dating from the investigations of men like Robert Plot and Edward Llwyd, based in the Old Ashmolean Museum in the 17th and 18th centuries, but it was not until the appointment of the celebrated and colourful Revd. 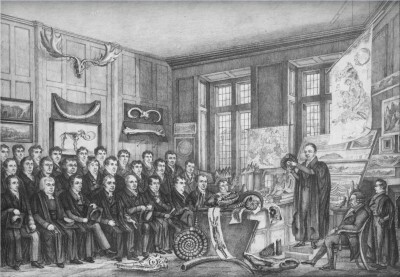 William Buckland as Reader in Mineralogy in 1813 and Reader in Geology in 1818 that organised courses of lectures, supplemented by local field excursions, were given. For nearly 100 years, until 1911, the history of geology and mineralogy at Oxford is essentially the history of its professors (there were no demonstrators or lecturers), and it is the history of what we would nowadays call their ‘research’. They gave some lectures, but in their audiences interested senior members usually predominated over undergraduates; there was no Honour School of Natural Science until 1850, and no separate school in geology until 1888. The infant science of geology was preoccupied with the nature and origin of fossils, and with exploring the processes affecting the earth’s surface, now and in the past. Early mineralogy encompassed the primitive study of rocks per se, as well as of individual minerals, and was largely the preserve of the early chemists. Fields of enquiry in both subjects were diffuse and it was not until the publication in 1830-33 of Principles of Geology, by Buckland’s pupil Charles Lyell, that the way was shown to bring order and logic to bear. By the mid-19th century Oxford’s handful of scientists, including Buckland’s successor John Phillips, and Nevil Story-Maskelyne, the Professor of Mineralogy, prevailed upon an unwilling university to build a new Museum, opened in 1860, to accommodate its natural history collections and to provide facilities for teaching and research in the sciences. Geology and Mineralogy were allocated separate quarters in the museum and occupied them until 1949 when they moved into the former department building on Parks Road, opposite Keble College. 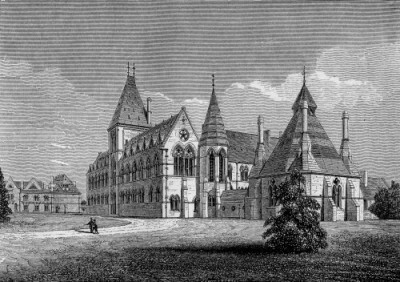 Lithograph of the University Museum, circa 1880, with the Clarendon Laboratory in the background. The east wing of the Clarendon was demolished to make way for the 1960s laboratory building, but the rest of the old Clarendon is encased within the former Earth Sciences building. In the year of its opening, the new University Museum was the scene of the historic debate at the British Association meeting in which Bishop Wilberforce of Oxford crossed swords with Thomas Henry Huxley over Darwin’s recently published Origin of Species. Professor John Phillips, revered as one of the most knowledgeable 19th century geologists, remained rather conservative and unable sincerely to embrace Darwinism and its clear implications of a vastly longer history of the earth than was acceptable to current theological doctrine. Phillips died in 1874 and was succeeded by Joseph Prestwich, the son of a wealthy wine merchant, who had gained much experience of continental geology while travelling on his father’s business. A renowned authority on the Tertiary and Quaternary deposits, Prestwich may also be accounted one of the first applied geologists, concerning himself greatly with the useful applications of his subject. He had ideas about the construction of a Channel tunnel and at Oxford was a leading force in the draining of the Botley marshes and in the provision of an adequate clean water supply for the city. He also did much to encourage the education of women in the conservative Oxford of his day. On Prestwich’s resignation in 1887 at the age of 75, A.H. Green, formerly of the Geological Survey and Professor of Geology and of Mathematics at the Yorkshire College at Leeds, was appointed to succeed him. The leading authority on coal-bearing strata, and a very fine teacher, Green saw the establishment of geology as a subject in its own right for the award of Honours. Sadly, he died of a stroke in 1896, having occupied the chair of geology for only 8 years. Nevil Story-Maskelyne, who had held the Professorship of Mineralogy since Buckland’s death, resigned in 1895, to be succeeded by (Sir) Henry Miers, later Principal of the University of London and Vice-Chancellor of Manchester. He greatly expanded his department and appointed the first Demonstrators (one of whom, H.L. Bowman, was to succeed him as Professor in 1909). Almost simultaneously, W.J. Sollas – an eccentric genius – came from Dublin to succeed Green in Geology. In his earlier years Sollas built up a vigorous department. Conscripting his two daughters as unpaid research assistants and appointing the first Demonstrators and Lecturers, he taught many distinguished students and carried on research in virtually every facet of geology as it then was; he was one of the last true geological polymaths. As time progressed – Sollas occupied the chair for forty years – he became increasingly eccentric, though continuing to do good research, particularly in hominoid evolution, and much of the responsibility for running the department fell to his Demonstrator, J.A. Douglas, who succeeded to the professorship on Sollas’s death in 1936. It had long been realised – though perhaps not by Sollas – that the old quarters occupied by geology in the Museum had become utterly inadequate, and Douglas’s main preoccupation was the planning of a new department to be provided by the enlargement and modification of the old Clarendon physics laboratory. Delayed by the Second World War, the new building was finally occupied in 1949, a year before Douglas’s retirement. Up to this time, Oxford’s geology had been mostly confined to the classic fields of historical geology and palaeontology; mineralogy had been catered for separately. With the move to the new building, Professor Bowman having retired in 1941, the two subjects were amalgamated in the Department of Geology and Mineralogy, under the supervision of the Professor of Geology. On Douglas’s retirement, L.R. Wager, a distinguished petrologist, and formerly professor at Durham, was appointed; the research effort was greatly increased and radically changed in emphasis towards petrology and the newly emerging subject of geochemistry. Staff and student numbers grew steadily and the department under Wager’s leadership began to acquire a high reputation, nationally and internationally. This enhanced reputation was materially helped by the establishment in the department of the first laboratory in Britain for geochronology and isotope geochemistry. Wager died in office in 1965, having seen the permanent academic staff of his department double to 14 members, research students increasing from 3 to 22, together with several post-doctoral research assistants, this growth having necessitated an extension to the building, completed in 1963. Wager was succeeded by E.A. Vincent, then Professor at Manchester and previously a lecturer in geology and Reader in Mineralogy at Oxford, who set out further to consolidate the department by increasing undergraduate numbers and broadening the active research base by encouraging sedimentology, structural geology and, latterly, geophysics. New lecturerships in applied geology and in geophysics were instituted, and the formerly independent Readership in Geodesy allocated to the department. Vincent’s retirement in 1986 marked the end of the one-professor department. J.F. Dewey, formerly Professor at Durham, and with an outstanding international reputation in structural geology and tectonics, was appointed to succeed Vincent as Professor of Geology. At the same time, the established Readership in Mineralogy (then vacant) was upgraded to a new Professorship of the Physics and Chemistry of Minerals, to which J.D.C. McConnell, from Cambridge, was appointed. New lines of research were initiated by these professors, which was accompanied by further expansion in staff and research personnel. Professor McConnell retired in 1995, to be succeeded by R.K. O’Nions, formerly Royal Society professor at Cambridge and a leading international authority in geochemistry, who assumed headship of the department (where he had been Demonstrator and Lecturer in Geochemistry from 1970 to 1975). His arrival heralded further expansion of the research effort, particularly in the field of isotope geochemistry. Professor O’Nions was succeeded by Professor John Woodhouse, a world-renowned seismologist, in 2000. In 2004, Professor Philip England, an expert in tectonics, took over the headship of the department. In the same year, Alex Halliday was appointed Professor of Geochemistry. In 2010 the Department moved to a new purpose-built building in South Parks Road, with Professor John Woodhouse leading the Department for a further 2 years until January 2013, when the role passed to Professor Gideon Henderson. Since September 2017, the Head of Department has been the Chair of Geochemistry, Professor Chris Ballentine. Throughout their long history, Oxford’s departments of Geology, Mineralogy, and now Earth Sciences have produced many outstanding leaders in their subject, from Charles Lyell in the earliest days, through men of the calibre of W.J. Arkell in the 1920’s and 30’s, to more recent times, when Oxford graduates have occupied many professorial chairs; led the geological branches of major oil companies; provided a recent Director of the Geological Survey – and several Presidents of the Geological Society of London.